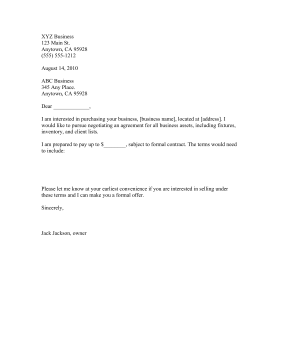 A letter intended for a business owner or investor to let another business owner that he or she would like to purchase the business. Includes spaces in which to make an offer and describe the terms of the potential contract. I am interested in purchasing your business, [business name], located at [address]. I would like to pursue negotiating an agreement for all business assets, including fixtures, inventory, and client lists. Please let me know at your earliest convenience if you are interested in selling under these terms and I can make you a formal offer.